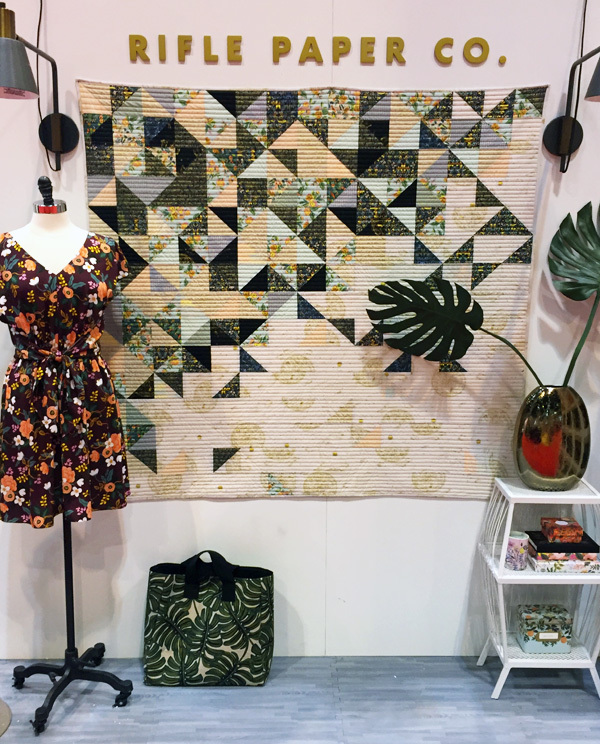 Quilt Market always goes by so quickly and this year was no exception…I can’t believe it’s already over! It was held in St. Louis this year, and I was pleasantly surprised how beautiful St. Louis is! It’s such a fun city to explore and so clean, and almost all of the museums, gardens, and even the zoo are FREE! I was showing off Hello Jane, and new patterns for the Spring. Some of them you’ve seen and some of them I’ll post about this week. My sweet friend Carly came with me this time, and we made these paper flowers in our hotel room the night before (tutorial found here). Big Sky (above) was my favorite new Moda line coming out. 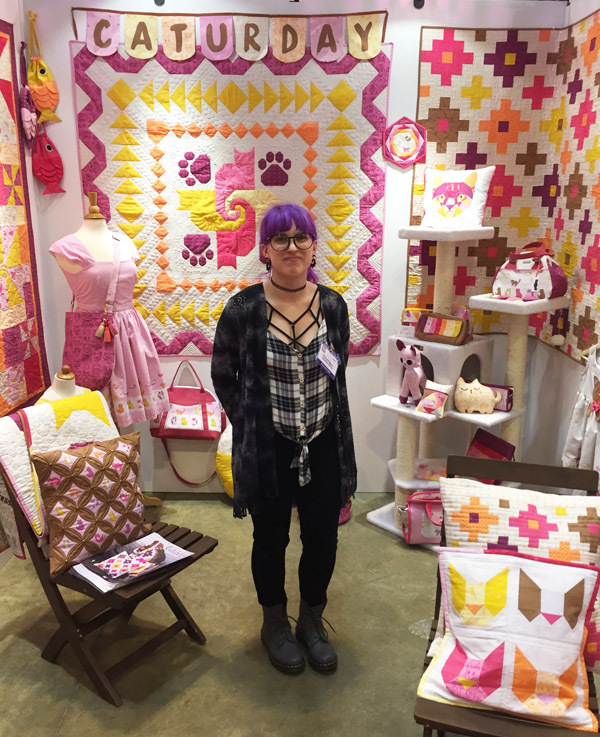 The bear print is just the cutest, and look how cute her Sprocket Pillows are (tutorial here)! I was excited to see Gingham Girls in person! 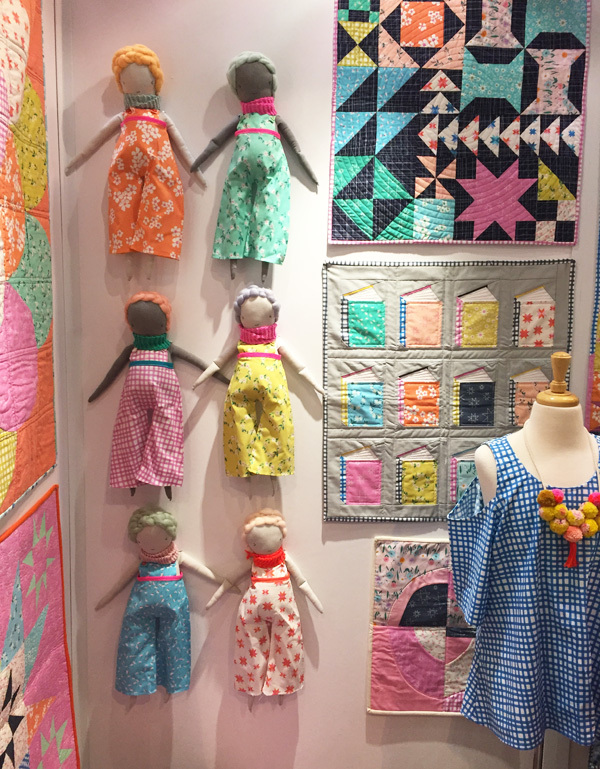 Amy is a dear friend and her quilts are gorgeous. Sharing a booth with Amy is Melissa…hence the Zebra in my photo. :) Melissa’s line is Safari Party, both lines for Riley Blake. In the Windham section Daisy Chain by Annabel Wrigley was just so springy and beautiful. How cute are those little dolls? Caturday by Felice Regina was another favorite. So fun! I’m excited for the new Rifle Paper Co. line for Cotton and Steel (above). 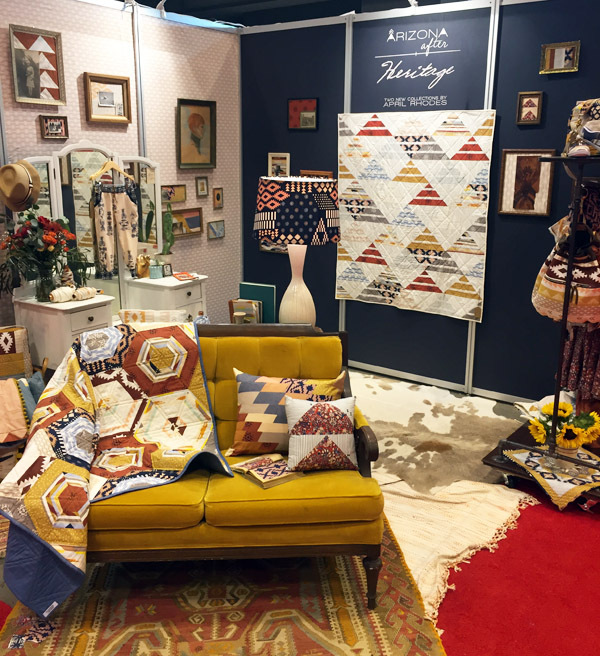 Art Gallery Fabrics had beautifully styled booths as always like the April Rhodes booth below. 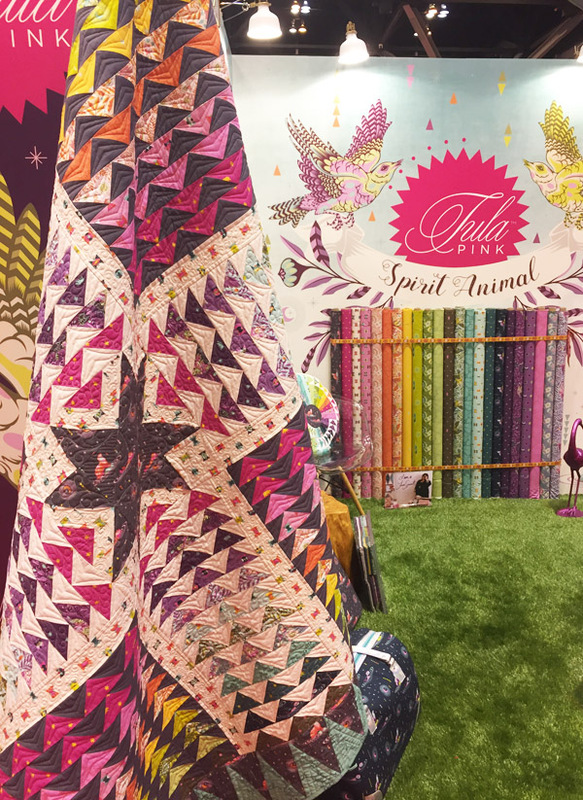 Tula Pink always has a colorful amazing booth, I always love looking at the detail in her quilts! 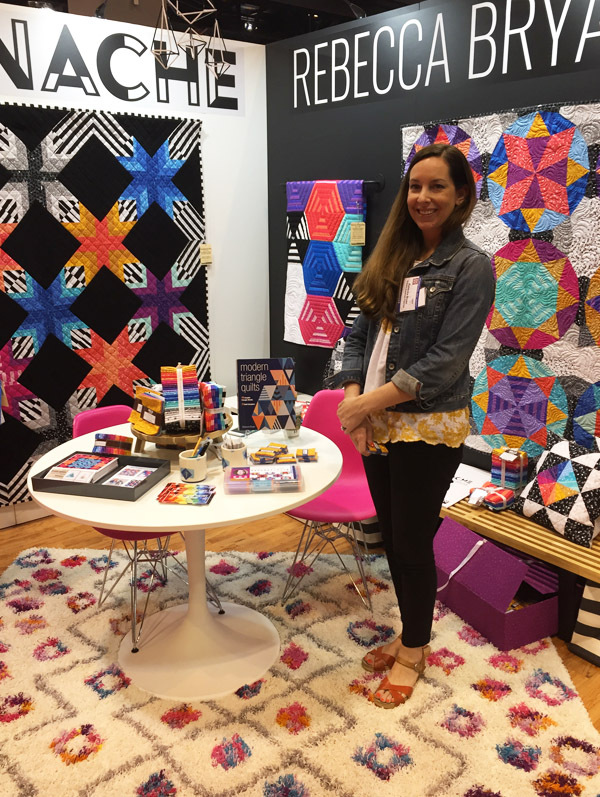 Rebecca Bryan was in her first booth showing her line for Robert Kaufman Panache. So graphic and colorful…I loved it! 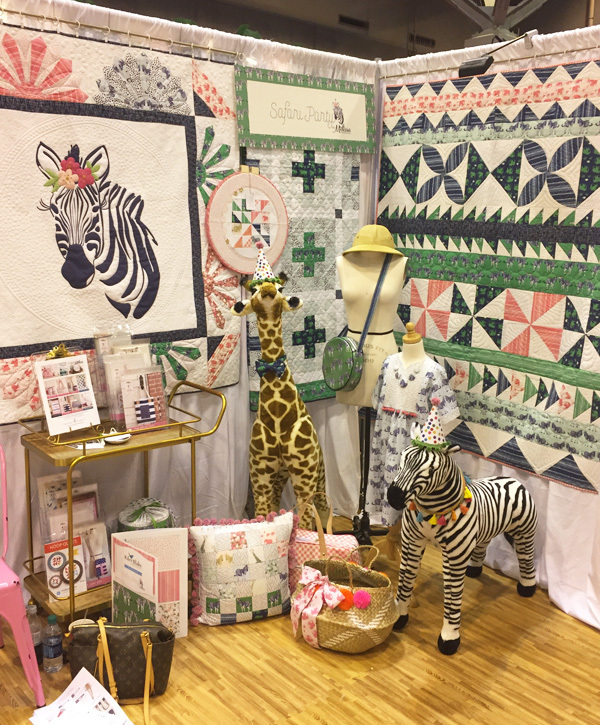 My favorite booth was by Simple Simon and Co. showing their line Just Add Sugar for Riley Blake. So smart and cute! 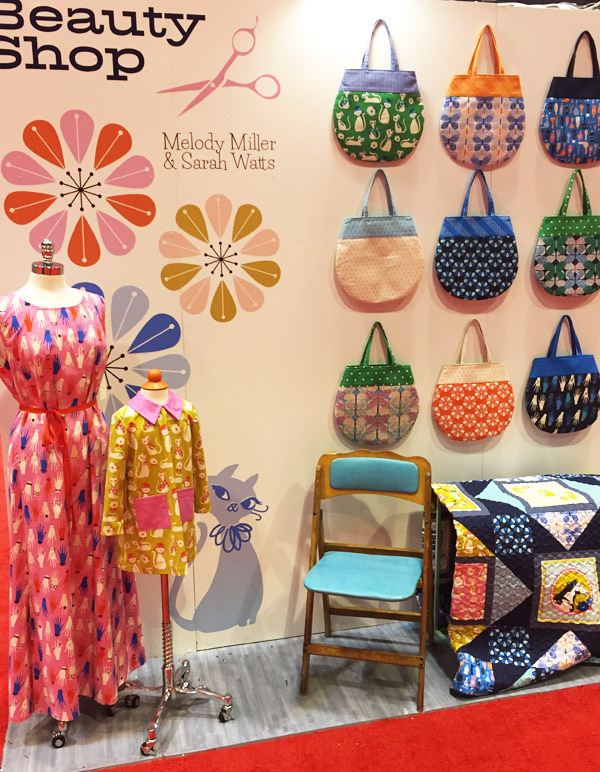 One more cute Cotton and Steel display…loved the purses. I’ll post some new patterns this week, in the meantime they are in my shop. Nope it’s not…I will post when it is, I think it ships in the next couple of weeks! 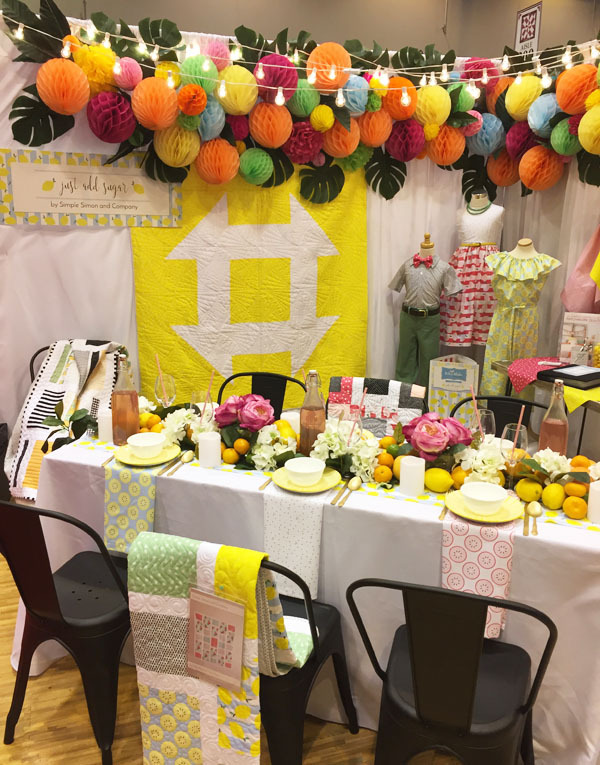 Thanks for the market pics, looks like there was so much eye candy…I bet it was an explosion of fabric fun! 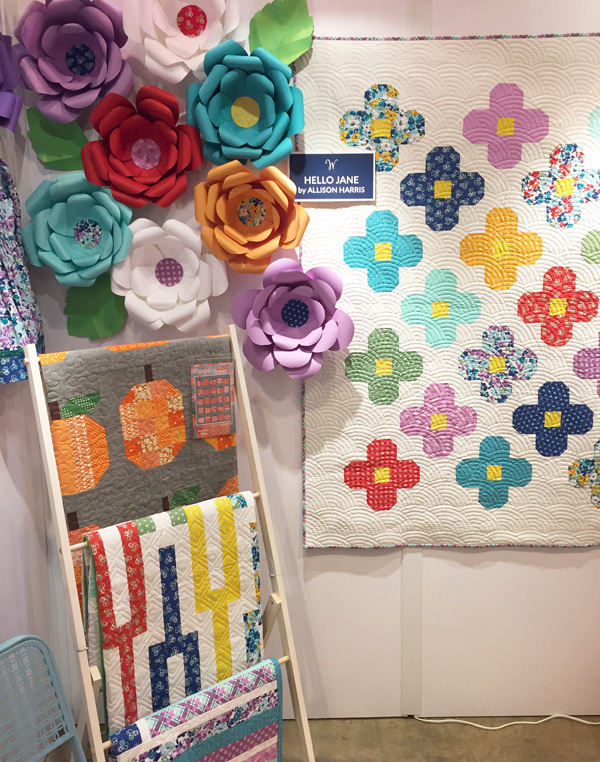 Thank you also for the discount…that Bloom is adorable and a must make! So cute! 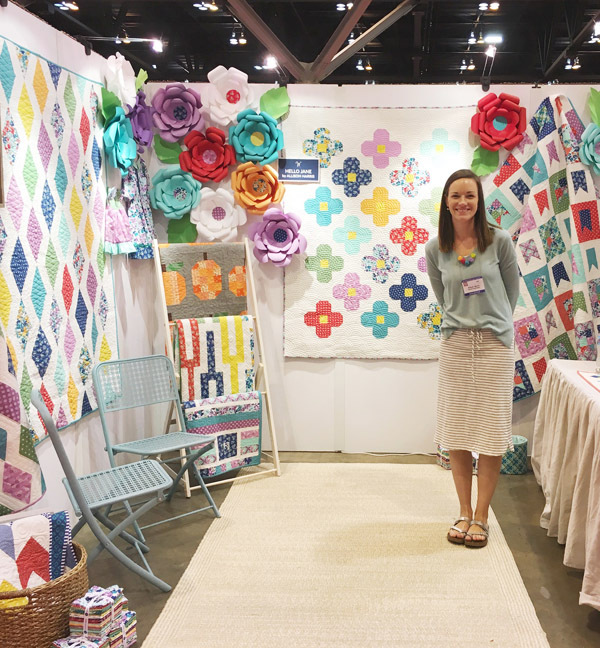 I love the flowers quilt hanging behind you in the first picture. Adorable! Thanks for sharing the pictures. The lighting must have really been bad. 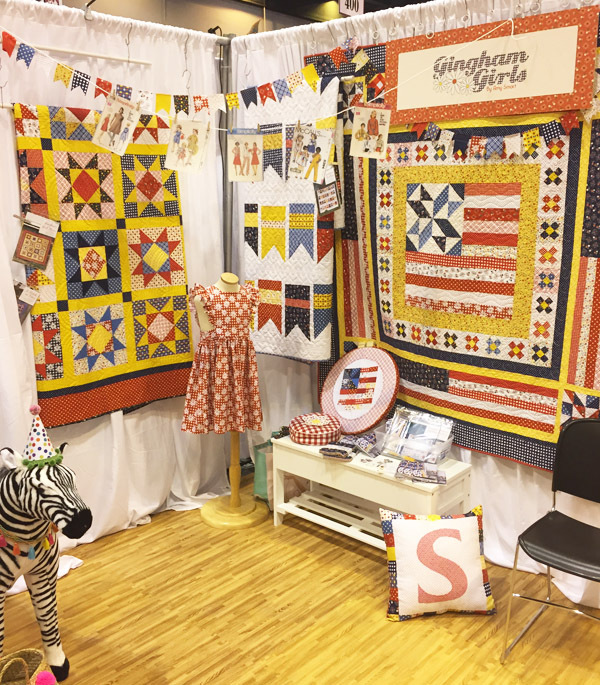 I think every blog that has posted about the St. Louis Quilt Market has remarked on the bad lighting! They pictures looked nice anyway. Thanks for the nice comments about St. Louis. I live 11 minutes from the Arch on the other side of the river in Illinois. I sure wish I could have come over and checked everything out ! I had such a good time chatting with you! I love how bright your booth was. :) Thanks for taking a picture of me in my booth. I never remember to ask anyone to take pictures so I’m glad there was at least some evidence I was there to show my family! Thanks for sharing your market photos and thoughts with us. Congratulations on your own lovely booth. The flowers were a great touch! 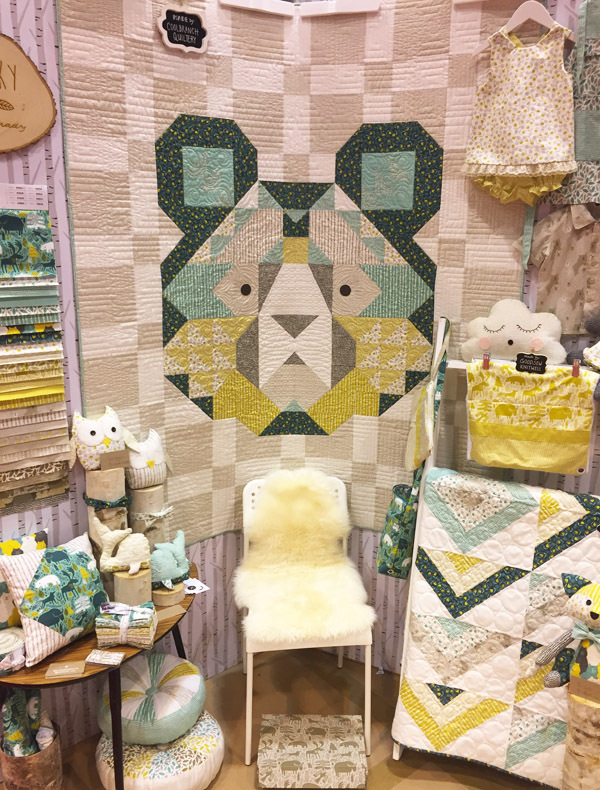 I love the big bear quilt … How can I find the pattern , please ?